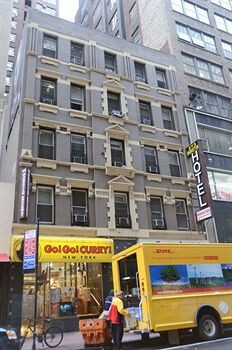 Property Location With a stay at Manhattan Broadway Budget Hotel in New York (Midtown West), you&apos;ll be minutes from Port Authority Bus Terminal and Times Square. This hotel is close to Macy&apos;s and Broadway.Rooms Make yourself at home in one of the 43 air-conditioned guestrooms. Satellite television is provided for your entertainment. Bathrooms have shower/tub combinations and hair dryers. Conveniences include laptop-compatible safes and desks, and housekeeping is provided daily.Business, Other Amenities Featured amenities include a business center, a 24-hour front desk, and an elevator (lift). A roundtrip airport shuttle is available for a surcharge.